CA New Syllabus 2016 | Changes in CA CPT IPCC and CA Final Syllabus. We have already known that The Institute of Chartered Accountants of India (ICAI) announced CA new syllabus from 2016. Today ICAI released a new notification about ” CA New Syllabus 2016 ” full details. This notification contains How to become ” CA ” through foundation route or direct entry route, Name and Number of Papers in Foundation, Inter and Final syllabus from 2016 and other training details like Four Weeks Integrated Course on Information Technology and Soft Skills (ICITSS), Practical Training and Advance Four Weeks Integrated Course on Information Technology and Soft Skills (AICITSS). In Foundation course Paper 2 and Paper 4 will be Objective type papers and remaining are descriptive papers. ICAI didn’t remove Information Technology and Strategic Management Paper in CA IPCC Group – 2 and also ICAI didn’t remove Information Systems Control and Audit paper in CA Final. Read remaining changes as per new syllabus in CA CPT, IPCC and CA Final from May 2016. 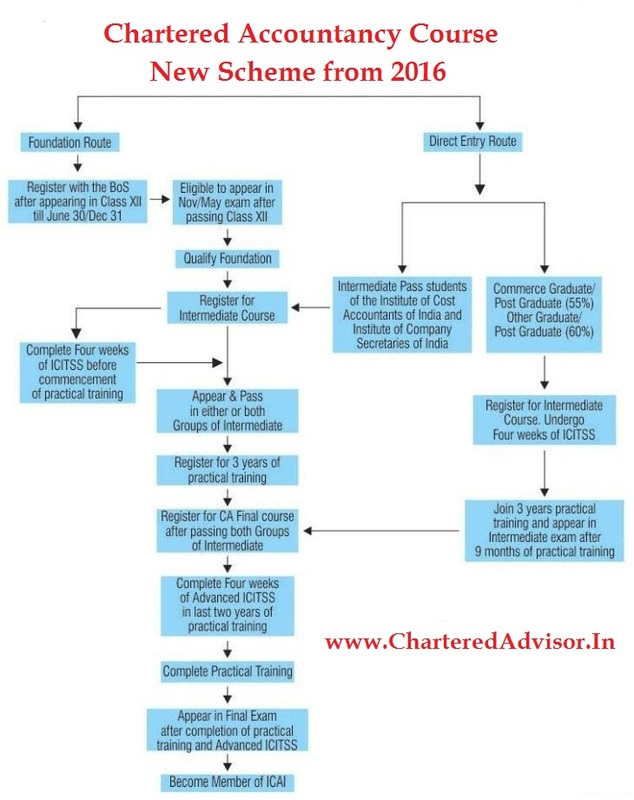 ‪Note: ICAI has decided in principle the above mentioned Scheme. However, the scheme will be notified in the official Gazette in due course. Register with the BOS for the Intermediate course (provisional registration allowed to the students doing Final year of graduation). Successfully complete Four Weeks Integrated Course on Information Technology and Soft Skills (ICITSS) before commencement of the practical training. Appear in Intermediate Examination after Nine months of Practical Training. Register for the Final Course after qualifying both Groups of Intermediate Course. Note: Candidates who have passed Intermediate level examination of ICSI or ICWAI and enter the CA Intermediate course directly shall be treated at par with Foundation passed students and shall have to undergo the CA course in the manner into the Foundation passed students. Passing percentage:Aggregate- 50% and Subject-wise- 40% at one sitting. Objective type question of I or more marks. There are 8 papers in CA IPCC new scheme from 2016. In previous notification ICAI said that they are going to remove Information Technology and Strategic Management Paper from CA IPCC Group – 2 completely. But in new notification, Information Technology & Strategic Management paper also included. In new syllabus Direct tax laws for 60 marks and Indirect tax laws for 40 Marks. Read below changes in IPCC new syllabus from 2016. See below image for CA Syllabus 2016 at a glance. ICAI said that “We are hopeful that we will able to get permission of the government to introduce CA new syllabus 2016 and once we get the permission from the government then we will able to launch CA new syllabus 2016. I would like to inform all the students for your concern, you will continue in the current scheme. Don’t get any confusion. We will give ample opportunities (Some Fixed Number of Attempts) to complete the CA exams under the current scheme. ICAI will release applicability notification of this ” CA New Syllabus 2016 ” in one month. We will update those details as soon as possible. So stay in touch with this article !! 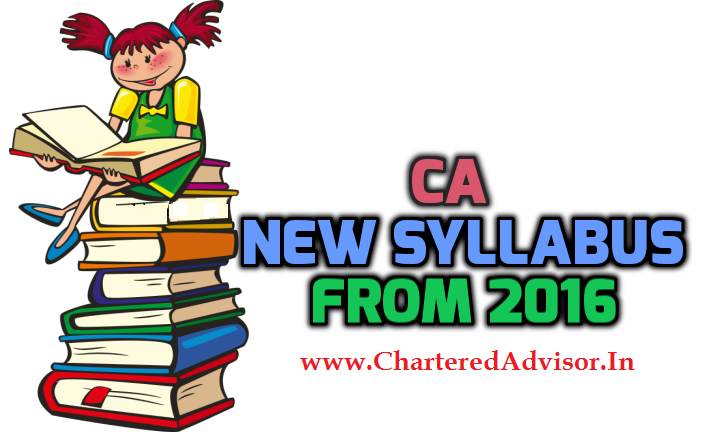 Share this article ” CA New Syllabus 2016 | Changes in CA CPT IPCC and Final From May 2015 ” to your friends, who are studying CA CPT, IPCC and CA Final.